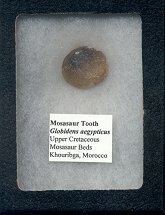 Size: Frame is 3.5" X 4.5", tooth is about 1"
This is a nice specimen of a Globidens aegyptiucus Mosasaur tooth from the Cretaceous of Morocco. The button-shaped crown of the tooth looks much different than most conical Mosasaur teeth.The marine lizard tooth exhibits excellent detail - the enamel of the tooth is wonderfully preserved. The fossil has wonderful color and is well showcased in the glass-covered frame. 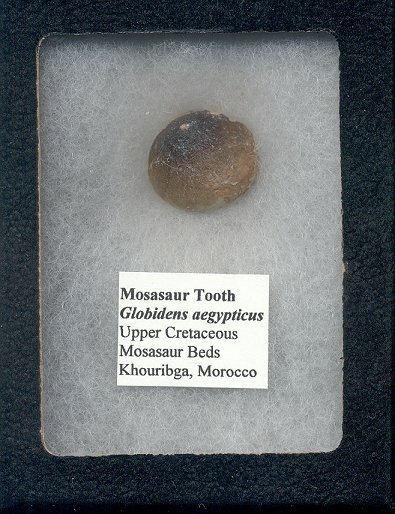 This is a very displayable Globidens tooth from Morocco.